We’ve picked some of our favourite ways of incorporating childhood treehouse dreams into bespoke, fun and useful treehouses for the young at heart. Whether we wanted to slay dragons or play the heroic princess, a lot of our childhood fantasies were inspired by the fairy tales we heard growing up. Most of those narratives demanded a castle. But whilst our younger selves had to employ our imagination to provide these grand dwellings, a treehouse can rise above the metaphor, and with some architectural tweaks, look a lot like a fairy tale castle. At Blue Forest we have built many turreted roofs – for children and adults alike. A secluded tower incorporated into a treehouse instantly adds a touch of fairy tale intrigue. The interiors can be designed to incorporate that old world mood or, for a modern twist, could provide a dramatic contrast for a newfangled castle with a romantic exterior and contemporary luxury interior. Our Sleepy Hollow Treehouse is a great example of blending the childlike fantasy with the practicalities and enjoyments of adult life. 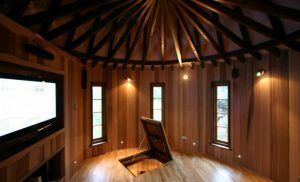 It features a turret and many play features as well as a wine cooler and drinks fridge and food preparation area so that it can be enjoyed by adults, children and big kids alike. Slides, rope bridges, trapdoors and fireman poles are the stuff of kids playgrounds, but that doesn’t mean the adults can’t have a little fun too. 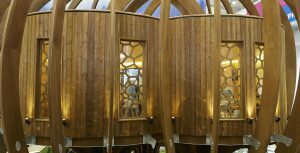 Having these features incorporated into a treehouse means the kids can play and the adults can let loose too should the feeling strike. Our Fibonacci inspired treehouse epitomizes the way a slide can be used to create a contemporary and stylish finish – as well some serious fun. It is built with stainless steel so that it reflects the landscape creating a modern yet integrated look. The ride is exhilarating! Launch yourself from the 4m high tree platform and enjoy the descent, weaving between the trees for more than 20m, ending near the swimming pool and outdoor cinema. Designed and built especially with those big kids in mind. Every James Bond fan grew up feeling an unquenchable thirst for a gadget-filled hideout complete with trapdoor for a quick exit should Oddjob appear with his razor-edged bowler hat. Let’s be honest, those flights of fancy never quite fade, and the gadgets have only become more tantalising. 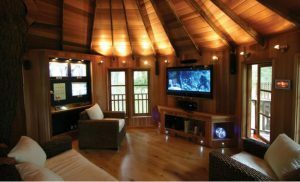 A treehouse is a wonderful place to implement the tantalising tech the world has on offer. From widescreens that hide behind wooden sliding panels to voice activated music systems, there is a wide range of ‘grown up toys’ on the market. In the spirit of our inner-spy, for our High-Tech Hideaway we built a treehouse with an integrated state of the art biometric security system complete with fingerprint locks and a CCTV system. The control center features access to five colour, night vision cameras that can move and zoom, take still shots or video footage of approaching visitors to the treehouse. A treehouse is the perfect flexible format for den with entertainment center or a study filed with all the gadgetry your child or grown up self could dream of. We only caution you to reconsider those ejector seats – they can become a little impractical. 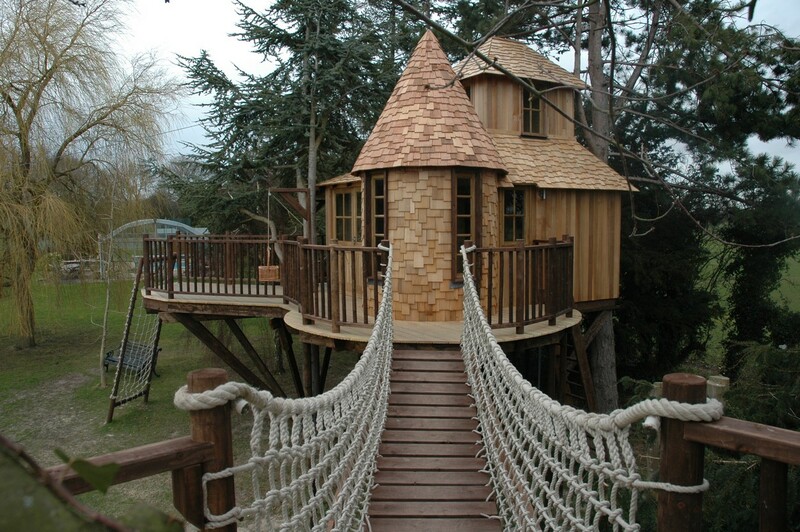 Often when we imagined our ideal treehouses as a kid they would be a place to play and make things. Whether we were aspiring finger painters or enjoyed playing house, the treehouse was a place to let the imagination run wild. With that in mind we have custom-built treehouses specifically to encourage and nurture creativity. From music and art studios to treehouse kitchens, a place that brings back elements of childhood almost always helps creativity flow. Thus the EcoPerch music studio we built for one of our clients provides an oasis away from everyday life. It is only a short walk from the house but represents a different mental space from the routines of whilst retaining all the custom features of a state of the art music studio. 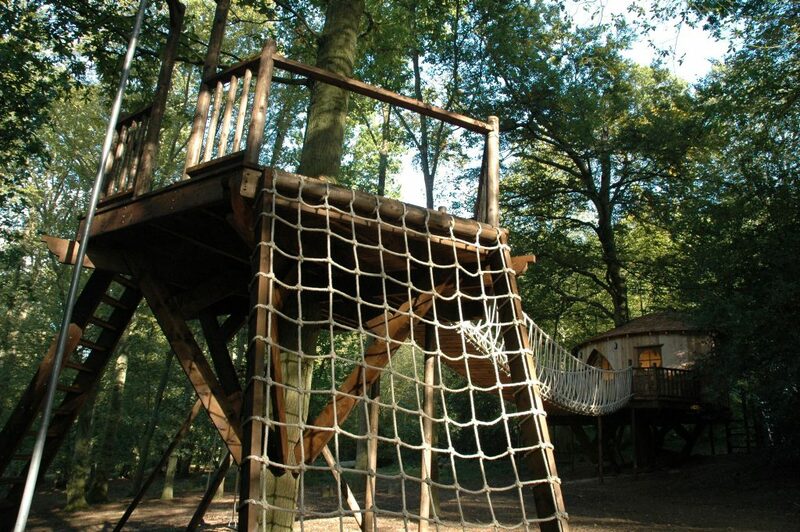 So whether you’re after the thrill of childhood scrambles up rope ladders and acts of defiant bravery played out on treetops, our you seek the carefree, wind-in-the-hair, daydreaming calm of your own little space in the branches, there’s a treehouse waiting to be designed to do just that. We hope you don’t need any further convincing! The long and the short of it is that you are never too old for a tree house. If you fancy injecting a little more adventure into your life then get in touch with our design team who would love to turn your tree house dreams into a reality!